Daniel Jimeno Romero, a 27-year-old from Madrid, was gored to death during the annual running of the bulls in Pamplona and nine others were injured in what became the bloodiest run in decades. Mr Romero died after a bull's horn pierced his neck and lungs during the half mile sprint through the cobbled streets of the northern Spanish town. He is the first man to be gored to death during the run for 14 years. He was brought down by a 1,130 lb (515 KG) brown beast named Capuchino which became disorientated and aggressive after separating from the pack of bulls. Each morning at 8 o'clock during the eight-day fiesta six fighting bulls are released to stampede through the winding streets to the bullring. Fuelled by alcohol during what has become one of Europe's biggest street parties, participants test their bravado and sprint alongside the bulls while attempting to dodge their horns. Friday's run, the fourth of this year's San Fermin festival was described as the bloodiest in decades and raised the death toll to 15 since record-keeping began in 1911. Mr Romero was treated at the local hospital but surgeons were unable to save him and he was pronounced dead at 8.45 am. "He suffered mortal injuries, so there was nothing we could do to save his life," said Esther Vila, the surgeon who operated on him. "He had lost a great deal of blood." Pamplona´s mayor Yolanda Barcina expressed her devastation at the death. "In 11 years as mayoress, nothing like this has ever happened before," she said. Video footage showed one man being flipped into the air by the bull who then repeatedly charged him as he lay curled on the ground. Others attempted to leap over wooden barriers that line the route to escape the lethal horns of the bull who charged anyone in his path. But at least three other people were gored by the animal raised on the Jandilla ranch, which has a reputation for breeding aggressive bulls that perform well in the ring. Another six people were being treated for injuries, said a spokesman at the Virgen del Camino hospital in Pamplona. Among them was a 61-year-old American man who was said to be in a serious condition in intensive care having suffered head injuries. Another American man in his sixties suffered a fractured elbow and a 20 year-old British man was reportedly being treated for minor injuries. An Australian, an American, a Scottish man and a Swiss national were injured in other runs this week. The last fatality occurred in 2003, when local man Fermin Etxberri, 63, was trampled to death. Friday's death was the first fatal goring since that of American Matthew Tassio in 1995. Tens of thousands travel to Pamplona each July, where dressed in white clothes and red neckerchiefs they participate in the fiesta made famous by Ernest Hemingway in his novel, The Sun Also Rises. 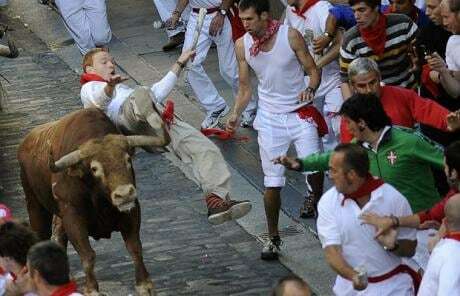 A British student was gored in Pamplona as he took part in one of the bloodiest runs for decades, which left one man dead. Alex Short, 20, from Watford, Herts., a student studying geography at Manchester University, was with friends on the last day of a three-day holiday at the bull-running fiesta and had taken part in the mad dash each morning. During the run on Friday one of the bulls, Capuchino, became separated from the pack and started to lash out at the crowds. He gored to death 27-year-old Daniel Jimeno Romero, from Madrid, and injured nine others, including Mr Short. Mr Short said: "I was running with two of my friends. I had seen the bulls go by and was thinking that I had done a rather good job. Then I saw another bull which fell over one of the runners and when it got up it turned round and came back on its own and charged at several people. "People were running in all directions and falling over, trying to get out of its way. "He charged me as I was running to get over the fence out of the street. I was thrown into the air. "After that things are a bit hazy because I hit my head fairly hard on the ground. I also grazed my shoulder. "Then he gored me in the left leg, in the thigh. "I haven't asked how deep the wound is. But I've been told it's not too bad. There is no muscle damage. But they are keeping me in here over the weekend until Monday or Tuesday in case of infection." He went on: "I didn't feel any pain. The adrenaline was just so strong. In fact afterwards I got up and walked away. I rolled under the barricade out of the run and got-up again. But then the police made me lay down again until the medical people came. "Now they've drugged me up and I'm still not in pain. But I was just so lucky. It wasn't until I saw the video that I realised how lucky." He added that one of his friends, Richard Morley, also 20, was running just behind him. "He saw me get up afterwards, thought I was okay and ran on into the bullring. It wasn't until he saw it all in slow motion on a giant screen in the bullring that he realised how serious it was and he and our other friend came straight to the hospital." Alex said that he had heard about the death of the Spanish runner just after reaching hospital. "I've just tried not to think of that. It's pretty scary stuff and I'm very unhappy about what happened and that it could have been me. "I feel so terribly sorry for that man and for his family." After making sure he was going to be okay, his friends went to Bilbao to get their easyJet flight back to London as planned. "We only booked this up at the last minute - about five weeks ago. And we had to sleep rough in Pamplona because there were no rooms available," said Alex. His father, Peter Short, who has just retired as a manager with BP in London, has flown out to be with his son. he bulls, Capuchino, became separated from the pack and started to lash out at the crowds. He gored to death 27-year-old Daniel Jimeno Romero, from Madrid, and injured nine others, including Mr Short. Charles Starmer-Smith experiences the chaos and camaraderie of the adrenalin-fuelled dash from danger that is the Pamplona bull run . "It's the bulls or me." As far as ultimatums from the wife go, this one hardly seemed unreasonable. Either Carlos Gil could opt to be chased down Pamplona's narrow streets by half a dozen 100-stone bulls, or he could return to the bosom of familial life and keep his buttocks and marriage intact. Carlos, one of Pamplona's most venerated bull runners, had only just made his choice. He would return home to his wife in Malaga. But, as he blinked back the tears I realised that the encierro runs not only through the streets of this Basque town, but also through the veins of the men of Navarre. coming of age. For eight consecutive July mornings for the next 42 years he lined up to face the toros again. He was now 62; his mind and body were still willing. But his wife was not. The gruesome scar that curves down from his wrist to his elbow put paid to that. Two years ago Carlos was gored by a bull, the horn tearing through his exposed flesh after a pile-up near the start of the encierro. After several days in hospital he sat out 2007's event. But now – in July 2008 – he was back, desperate to be part of the festival, even if he would not run the encierro. "I was lucky," he said. "It could have been much worse." The bull runs have claimed 15 lives since 1924 and injured hundreds more; the most recent death, of a 62-year-old Spaniard, was in 2003. Ernest Hemingway did much to popularise the San Fermin festival with his 1926 novel The Sun Also Rises. Ernesto (as the Spanish often referred to him – they had great trouble pronouncing his name) may have had a street named after him and a statue built in his honour, but it is men like Carlos, who have spilt claret on the streets of Pamplona, who have kept the traditions alive against the increasing hordes of tourists arriving to party, with well-thumbed Hemingway paperbacks tucked into their backpacks. Up to a million people now descend on Pamplona for the festival – and not everyone thanks Ernesto for it. "What happened is that Hemingway put the Sanfermines at the disposition of the whole world, and the whole world doesn't fit into Pamplona," said Julian Balduz, the city's former mayor. I was standing with Carlos and friends on a balcony above the main square as tens of thousands swarmed around the city hall below dressed in white-and-red costumes, waiting for the mayor to signal the start of the festivities. Every last vantage point was occupied – scaffolding, window panes, shoulders – but still they poured in, the side streets drowning in a sea of red and white. As the crowd bounced, white outfits turned pink, then red, as sangria and kalimotxo (a mixture of wine and coke) was thrown, champagne corks popped, and people surfed on top of outstretched hands. Photographers, cameraman and television presenters were dragged into the crowd and drenched. Finally, to riotous cheers, the mayor came out on to the balcony. Neck scarves that had been wrapped around wrists until now were raised skyward as deafening chants of "San Fermin", "San Fermin" reverberated around the square. The Txupinazo (rocket) fizzed into the sky to mark the start of the festival. Momentarily, the crowd fell silent. The rocket exploded – and then so did the city. From out of the hall came the marching bands – the crowds singing, cheering, dancing, drinking, sometimes all at once. I had never seen anything like it. Our own party soon descended on to the city streets. Tables and chairs were hurriedly arranged for a feast in the middle of the road. Eggs were fried in oil and garlic, and served up with tomato salsa, bread and cheese. Strangers stopped by and offered wine in return for food. They pulled up a chair and eggs were dispensed without a grumble. The rhythm of the day was now set. A wise few sprawled across the city's gardens and slept until lunch, but for most there are no siestas at this fiesta. You quickly realise that the Basques are exceptionally good-natured drunks. Women are not hassled, there are no fights, the police are as absent as the wine is omnipresent. But then San Fermin confounds all conventional logic. Political correctness, health and safety, and animal rights are largely ignored – and that is why this festival remains so popular. Fortified by a fair few glasses of Rioja, I was taken down by Carlos to walk the course. My heart began to beat faster as we reached the bottom of Santo Domingo hill, near where the bulls would be released for the first time at seven the next morning. And I would be there. He stopped. "Here," he said, his eyes gleaming with anticipation, "is where you should face the bulls. After you hear the rocket [which signifies the start of the encierro] you count to eight, turn and then run." Led by a group of steers, the bulls charge uphill to Ayuntamiento Square, their hind legs working like pistons. A bull may weigh up to 100 stones, but it can still run 100 yards in about six seconds, making Usain Bolt look anything but lightning. Then it's down through Ayuntamiento Square, into a short street called Mercaderes before a sharp right turn. Here, where hooves slide on cobbles, the splintered wood is evidence of the danger. It's then on to Estafeta, the long straight street leading to the bull ring. That the sand runs red with the blood of these same bulls in the afternoon corrida will never be something I can stomach. But for the three glorious minutes of the race, the tables are turned and the bulls are in charge. "If you fall, stay down. Better to be trampled than gored – trust me," Carlos added. I glanced at his arm and immediately wished I hadn't. With a sense of foreboding we returned to the Rioja-fuelled parties, for a day of drinking, tapas and dancing in the packed bars that line the streets off the Plaza del Castillo. It was almost midnight when a heavy-hearted Carlos eventually left to return to his wife in Malaga, turning his back on bulls for only the second time in more than 40 years. As I stumbled back to my apartment, across town the bulls were being solemnly led in by lantern-light from the pastures outside the city to their overnight pens ahead of the first encierro. Sleep that night remained elusive despite the copious amounts of Rioja consumed. I blamed the thumping music, but in truth it was Navarran nightmares of thundering hooves that kept me awake. In the morning, with a headache of Hemingway proportions, I wandered down through the Plaza Del Castillo, stepping over bodies lying in various states of undress. Last orders were still being taken in a few bars as the runners filtered quietly down to the course. I found myself wandering aimlessly among a crowd of people all dressed like me: white trousers, white shirt, red sash (faja), red neck scarf (pañuelo) and a rolled-up newspaper (the only defence allowed against the bulls). A couple of Aussies were goading each other with mock bravado: "Mate, as soon as you see the horns, those trousers of yours won't be white for long." It was not until I reached Mercedares Street that I realised he might have a point. My Pamplona plan had been simple: walk, run, hide. But there are absolutely no hiding places at the encierro. Workmen were erecting 12-feet-high barriers along the 850-yard route – to protect storefronts and spectators but, more importantly, to keep the bulls and runners penned in. 6.15am I escape the crowds to a quiet square, where the finest runners prepare themselves for the mayhem ahead. These are the divinos – they train all year in search of the perfect bull run. They were lost in their own thoughts: a flashback to images of bulls "cleaning the wall" [when horns meet wall, removing anything in the way], of pile-ups, or even friends lost. 6.30am I follow them down the hill to the small statue of San Fermin, tucked into an alcove in the wall. I keep my distance as candles are dutifully lit before they recite a prayer asking for the Saint to watch over them: "A San Fermin pedimos, por ser nuestro patrón, nos guíe en el encierro, dándonos su bendición [San Fermin, we ask you to be our patron, to guide us in the encierro, to give us your blessing]." Amen to that. 6.45am So where to start? The guide for people intent on running with the bulls was less than helpful. Under the heading "Most dangerous sections of the run", it answers: "All of them". I catch sight of Doug Howlett, the All Black winger, among the ranks of runners. Even he looks nervous. I opt for Ayuntamiento Square, where the biggest crowds have gathered. Safety in numbers and all that. Carlos's start position can wait another year. 6.55am By now my heart is hammering into my rib cage. I am offered a bottle of 30 per cent proof Pacharan, the local plum liqueur, by a sympathetic bystander. I take a long draw but it does little to help. I am not alone. The gutters that ran red with wine yesterday now fill with liquids from the bodies of a thousand terrified men. 6.59am I am now jogging on the spot in the cool air, surrounded by wave upon wave of runners, yet I feel very alone. The tension mounts. A few whimpers are audible, but a hush is descending. La hora de verdad – the moment of truth. 7am Bang. A few hundred yards from me a rocket announces that the corral door is open, the bulls are unleashed. Ten seconds later a second rocket fires, signifying that the last bull has left. This is it. A wave of noise comes from down the hill. I glance around but I cannot see beyond the massed ranks surrounding me. The roar sweeps up the hill, people cry out, camera bulbs flash. In the confusion of noise, motion, dust and screams, machismo seems to drain from every limb. "Oh sweet Mary," cries an Irish guy behind me. In the panic people jostle and shove, looking for escape routes. But there are none. The crowd surges forward, but I fight with my instincts to stand my ground. I look back and catch a glimpse of something black. Something big. It's time to move. I step out into the centre of the cobbled roads and run as never before. Five, ten, 20 yards. Someone's down, but there's no time to help. Elbows fly, shirts are grabbed and shoulders are dropped. I stumble and fall, crashing into a barrier. I haul myself back up but am pressed against a mass of writhing human bodies – we are stuck like nine pins waiting for the bulls to strike. 7.01am In the panic, someone is using me as human ladder. A muddied plimsoll meets my crotch, my stomach, my face, as a man grabs for the balcony railing above me. I soon realise why – the bulls are heading straight towards us, horns lowered like lances as they approach the cobbled bend. I close my eyes and brace myself for the impact. But their hooves gain purchase and 700 pounds of prime beef roars around the corner. I am alive. 7.03am Others have not been as lucky. On the opposite side of the street, just a few yards from where I stood, two runners are down, blood seeping on the cobbles below. Paramedics rush to them. Further on, a dreadlocked Australian stumbles around, blood pouring from his head, but he gives me a thumbs-up as he steps into the ambulance. I run down to Estafeta, the roars fading into the distance as the bulls enter the ring, a cocktail of adrenalin, endorphins and alcohol coursing through my veins. I embrace total strangers, talking in breathless, staccato sentences. 9am We are invited to an encierro brotherhood to celebrate. These fraternities convene every year to share wine, food and bull-running stories. My fears that we will be intruders at a private reunion prove ill-founded. They welcome us warmly, poring over the morning's race in microscopic detail. By now, my 30-yard dash has become a 300-yard glory run. 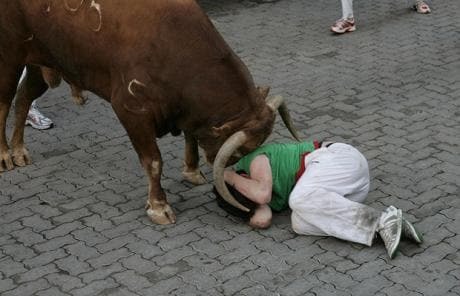 When you have run the encierro, you are allowed to talk a little bull. But there is much more to see. We leave just in time for the religious procession, as thousands follow a replica of St Fermin down the city streets. It is followed by a comical parade of the gigantes (30ft-high cartoon characters) and cabezudos (the big heads) bouncing along to the beat of the bands as dancers and entertainers follow behind. Silence descends as an opera singer delivers a beautiful aria from the balcony high above us and I wipe away a tear. The late, great sportswriter Ian Wooldridge once said of San Fermin: "There is a theory that middle-aged men go in pursuit of lost youth and young men in search of maturity. That's too profound for me. I went because you are surrounded by like-minded friends at one of the last sporting hurrahs in the world." He ran it 23 times. 1.25pm [a day later] I pick up a voice message on my phone as I walk through the arrivals hall at Heathrow. It's Carlos. He's back in Pamplona. To face the toro again? Now, that would be telling. San Fermin runs from July 6-14.